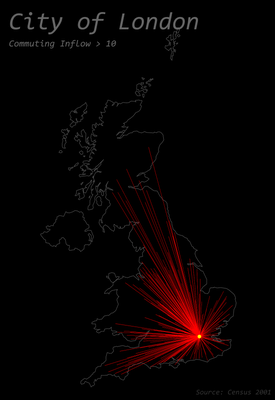 I've just selected 18 different districts from across the UK and looked at the range of commuting origins. A couple of points to note here. I've only included flows over ten in order to cut out some of the 'noise' associated with very low flow numbers. Also, for Belfast, the commuting data is split into Belfast North, South, East and West so that one looks a little different. Here's the image file for City of London, just as an example. Click the image to see it in full size. Does Anyone Look at This Blog?